Syfy kicks off its Christmas week tonight at 9 p.m. with themed episodes of Eureka and Warehouse 13. 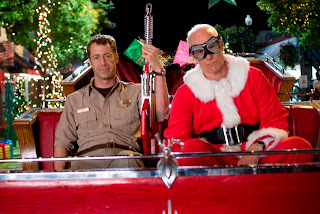 Eureka, "O' Little Town," 9 p.m.
Carter’s (Colin Ferguson) plans to visit family for the holidays are thwarted when he, Zoe (Jordan Hinson) and the rest of the town are trapped in Eureka by a glitchy electromagnetic shield – during a very un-Christmassy heat wave. Undaunted, Allison (Salli Richardson-Whitfield) mega-decorates and Vincent (Christopher Gauthier) serves up fruitcake while a mysterious Secret Santa distributes stunningly perfect gifts. Fargo (Neil Grayston) obsesses over plans for the Global Dynamics company party, getting only a “Bah humbug” from Jo (Erica Cerra). She has her hands full with the partying GD staff, including Dr. Noah Drummer (Chris Parnell) who nearly absconds with a volatile experiment. Even a runaway sleigh careening down Main Street fails to ignite Carter’s holiday spirit, especially since the low flying Santa turns out to be the eccentric Taggart (Matt Frewer), immersed in the study of “Santalogy” -- science that he insists will prove the existence of the elusive Claus. The halls get seriously decked when Dr. Drummer’s experiment, an unstable hydrogen crystal, starts to grow at a frightening rate. Carter and Henry (Joe Morton) attempt to deal with the potentially explosive crystal, but before long the true scope of the problem is revealed, and it will take more than tinsel and carolers to save Christmas—and Eureka. Warehouse 13, "Secret Santa," 10 p.m.